KAMOJO BAMBOO GARDEN AND WORK GLOVES - ENJOY YOUR GARDEN MORE! Are you sick and tired of your hands getting dirty and injured while you are working in the garden? Or, fed up with low quality gloves that don't last, smell bad, or are uncomfortable? Look no further! 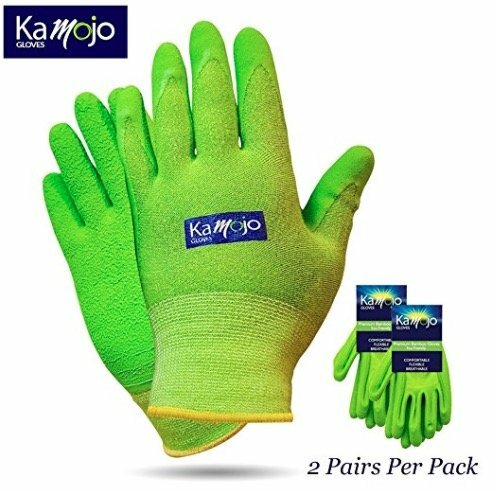 Spend your money wisely on Amazon's best selling KaMojo Bamboo Garden Gloves and Work Gloves and keep your hands clean from dirt, safe from skin wounds while having a superior grip for all your gardening works. KaMojo Gloves are crafted from a special bamboo fabric, making them the best and most durable gardening gloves. Here is how? ✅ Soft, comfortable and dry. Bamboo is highly absorbent and wicks away water three to four times faster than cotton. So in warm weather, KaMojo Gardening Gloves will keep your hands dry, cool and won't stick to the skin. In cooler weather, they keep your hands warmer. ✅ Excellent abrasion and puncture resistance. KaMojo Gloves are thicker than most garden gloves and coated with water and puncture resistant coating to give your hands all the protection they need. ✅ Naturally anti-bacterial and anti-fungal. Bamboo plants have a natural bacteriostatic agent called "Bamboo Kun" which inhibits odor-producing bacteria, creating KaMojo more hygienic and fresh smelling. ✅ Eco friendly. Bamboo and Latex are naturally biodegradable, so KaMojo Garden Gloves do not fill up the landfills as synthetic gloves. ✅ A perfect fit. Why compromise your comfort for one size when Kamojo offers 3 sizes? Please check the sizing chart before ordering! ✅ 100% satisfaction guaranteed. For any reason, if you aren't completely satisfied, just return it and we will REFUND 100%, NO QUESTIONS ASKED! This amazing SPECIAL discount ends soon with limited available stock; so click on the "ADD TO CART" button and put us to the test! ✅ WORRY FREE 1 YEAR GUARANTEE - Love the feel of our 2 Pairs Pack gardening gloves or return for replacement or full refund. Check sizing chart. If you have any questions about this product by Kamojo, contact us by completing and submitting the form below. If you are looking for a specif part number, please include it with your message.